Norfolk: You win this race and you get three years' pay. Clayton: What's a horse get out of it? Collic, cracked bones? Mister, did you ever see a horse run dead just to please the man on his back? What for, to get his picture in the paper? For glory? Norfolk: Some men live for it. Clayton: Horse don't give a damn who wins the race. Me neither. Sam Clayton: Just like old times. Luke Matthews: Yeah, you start trouble, and I start bleeding. The history of the western dates back to the earliest use of motion picture film, and is easily one of the most prolific genres ever produced. With such a wealth of catalog, finding an original spin for a story is a challenge, and while the unsung hero may be familiar to many, rarely does it extend to characters outside the human race as it does in this film, at least in principle. Writer/director Richard Brooks (credited as Robert on the cover blurb), best known for his Oscar�-nominated Cat on a Hot Tin Roof, Elmer Gantry, In Cold Blood or The Professionals, delivers a western with a different angle in Bite the Bullet. 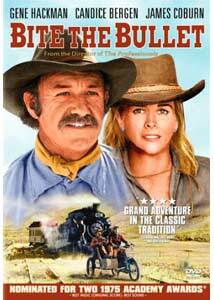 Oscar� winner Gene Hackman (The French Connection) heads a notable cast opposite James Coburn and Candice Bergen, in a screenplay based on the real story of a 700-mile endurance race in the turn of the century American west, and while the actors play an important role, it is their animal costars who are central to the picture. When a newspaper offers a $2,000 prize to the winner of a grueling cross-country race, it attracts a diverse range of characters after the bounty. A train travels across the country, collecting competitors and delivering them to the starting line. Sam Clayton (Hackman) is a hired hand whose task is to deliver the newspaper owner's champion race horse to the train, but his mission is delayed when he comes across a stranded colt, tied helplessly to the remains of its tortured and dying mother. Clayton's sympathy towards animals forces him to rescue the young horse, requiring him to ride the rest of the way to the starting line. Aboard the train, Luke Matthews (Coburn), a consummate gambler, ups the stakes on the booty awaiting the winner of the race by betting heavily that he will win. Also along is Miss Jones (Bergen), a young woman bent on claiming the prize for herself, despite the snickering of her male companions; Norfolk, an English sportsman who travels around the world in search of competition; a Mexican man hoping to free his family from poverty; a veteran Pony Express rider (Ben Johnson) known only as Mister; and Carbo, a young buck of a cowpoke (Jan-Michael Vincent) out to prove his worth. When Clayton finally arrives at the paddocks with his charge in tow, his boss dismisses him, but he is convinced by one of the other contestants to join in the race, which would pay his wages for years. The journey is not an easy one, with weeks of crossing the inhospitable desert and rugged terrain to the finish line. The way is fraught with peril, from the searing heat, lack of water, and natural and human predators. With each rider driven by their own motivations, only the fittest will survive, with the rest becoming casualties along the way. Bite the Bullet is not a film for those sensitive to animals' well being, as there are numerous occasions in which horses are abused or killed. The UK release had to have one sequence excised for an "illegal fall;" horses are seen falling off cliffs, or being ridden, lathered in foam, to their demise. This cruelty is a central theme in the film, and its depiction, while disturbing, is based on reality, and the attitudes towards animals at the time for the frivolous sake of winning a race. Hackman's character is the voice of reason early on, condemning the senseless slaughter of horses by those who would ride them into the ground, and reaffirms this position in several scenes throughout the film. Harkening back to the first studies done on horses in motion, the movie does make effective use of slow motion camerawork, including a ground breaking sequence where both slow and normal speed shots are combined to heighten the sense of despair one of the riders faces when his hopes for victory come to a crashing dead end. The expansive cinematography captures the hostile landscapes, and add to the tension. The soundtrack and score, both nominated for Oscars�, work extremely well. Its message aside, there are many areas of Bite the Bullet that fall short of their potential. While Brooks' mastery of sharp dialogue is a feature here, the character development he is also noted for is less than optimal, and some poor casting decisions weaken the plot. Hackman is said to have criticized Bergen's acting ability during her early career, for which she took him to task in this picture by enlisting his guidance. While the backstory of Bergen's character is unbelievable, she pulls off a good performance nonetheless. Hackman holds his own with ease, as does Coburn and Johnson. Jan-Michael Vincent plays his role with conviction, and it is worth the price of admission to see him get a dressing down for his arrogant and selfish attitude. The story itself flounders in places, either losing momentum or taking a few turns that undermine the potency of the film, especially the change in the Clayton character whose concern for animals is all but forgotten by the final reel. While not a standout in the genre, Bite the Bullet certainly provides a different perspective on the role the animals took in taming the Old West, and its flaws aside, does make for an entertaining watch. Image Transfer Review: Image quality of the anamorphic 2.35:1 transfer is very good, with a natural, film-like look. The source print has been preserved well with very few blemishes. Colors are a bit understurated in places, but some of this seems intentional. There is a bit of haloing on high contrast borders, which is typical of Columbia's scope transfers, a touch of aliasing in the odd place, but no other compression issues to be had. Spot checks of the pan & scan side didn't find any glaring defects, aside from the absence of much of the picture. Audio Transfer Review: Mono audio is preserved well with a clean, distortion-free presentation, and good tonal range. Dialogue is easily discernable, and the mix translates the visuals exceptionally well. While some may criticize the lack of a multichannel soundtrack, this one holds its own. Extras Review: Those champing at the bit for extras will be disappointed. Keep clear of the chapter names if you want to remain spoiler free. Bite the Bullet contrasts the drive for victory with its consequences, both moral and physical, in a portrayal of an actual endurance event. An epic, adventure driven western, its strengths lie in the strong visuals, ample humor and quality performances from its cast, but is somewhat derailed by pacing and unnecessary side stories. While not a "must own," it does warrent a look for its gritty realism and homage to the animals that carved out the western frontier, though the treatment is not for more sensitive viewers.